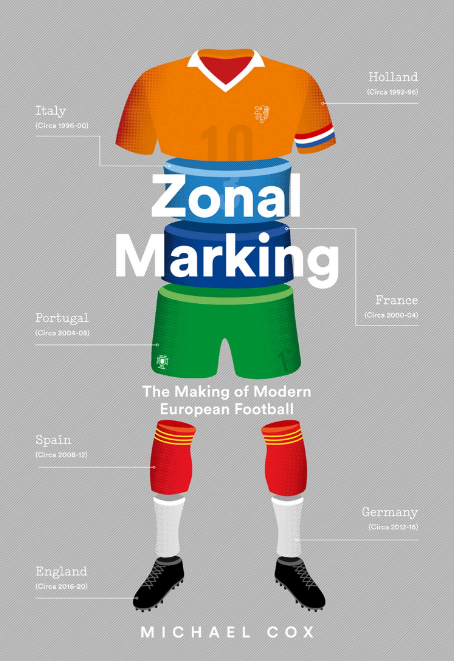 Zonal Marking | Zonal Marking – the book – is out May 30th. Click the book cover below-right for the Amazon link. Ajax followed their historic win at the Bernabeu in the previous round with a similarly impressive victory away at Juventus. There were two major themes from the first leg in Amsterdam, a 1-1 draw. First, Ajax used Donny van de Beek in a man-marking job on Miralem Pjanic, which badly hurt Juventus’ passing from deep positions. 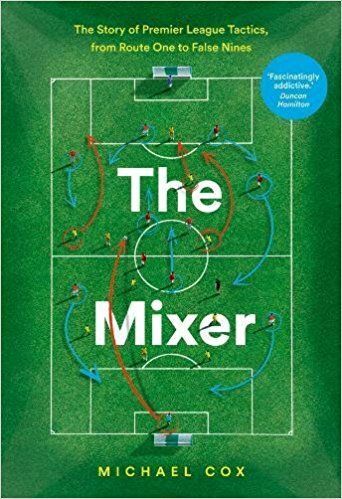 Juve seemed surprisingly troubled by this relatively simple tactic, and there was little sign of Leonardo Bonucci stepping forward to become the deep playmaker, as he used to do so effectively. 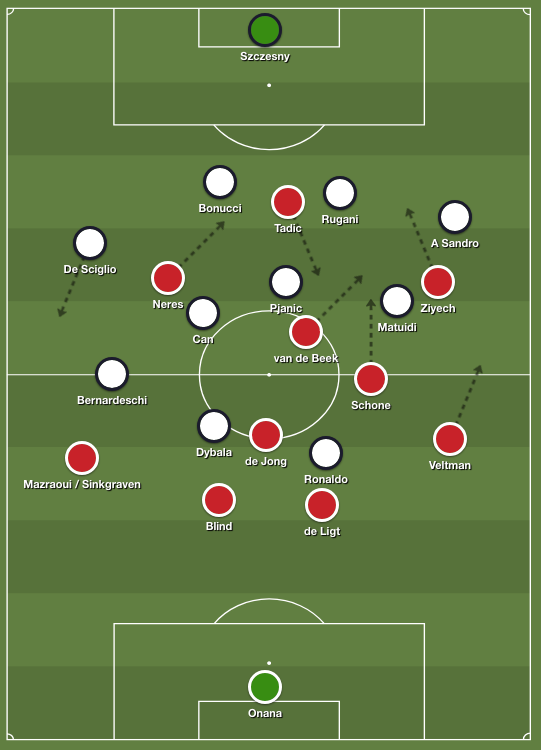 Second, Ajax had a very consistent approach in the final third. They would overload the right flank, bringing four or five players towards that flank, before quickly switching play to the left, usually by looking for attacking full-back Nicolas Tagliafico. He, however, was suspended for this game. In his place, Eric ten Hag was forced to use three players. He started with Noussair Mazraoui, a right-back, who got injured early on. He was replaced by the more naturally attacking Daley Sinkgraven, who later gave way to Lisandro Magallán, a centre-back by trade. Max Allegri, meanwhile, brought in Mattia De Sciglio for Joao Cancelo at right-back, Emre Can for Rodrigo Bentancur in the middle, and upfront Paulo Dybala returned – as captain – in place of the injured Mario Mandzukic. Chelsea played through Liverpool’s press impressively before half-time, but then a 10-minute burst of pressure won Liverpool the game. 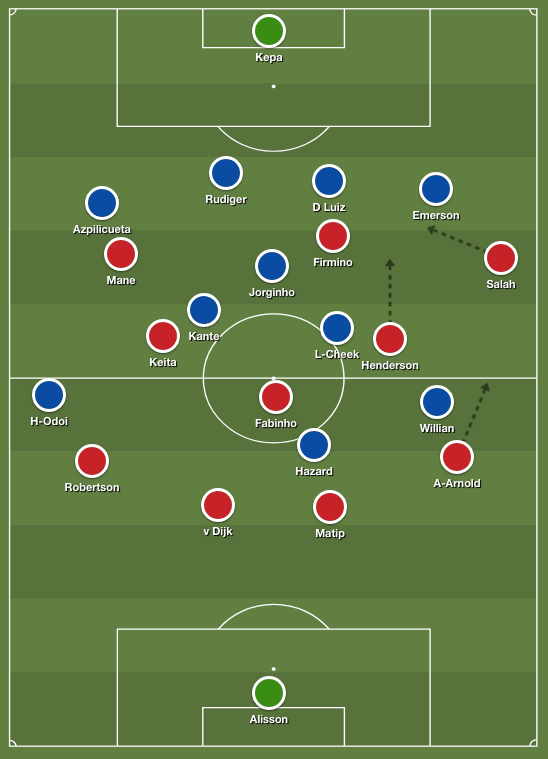 Jurgen Klopp’s team selection was as expected, with the trio of Fabinho, Jordan Henderson and Naby Keita – who started together in a 4-3-3 for the first time in the midweek win over Porto – again in midfield.